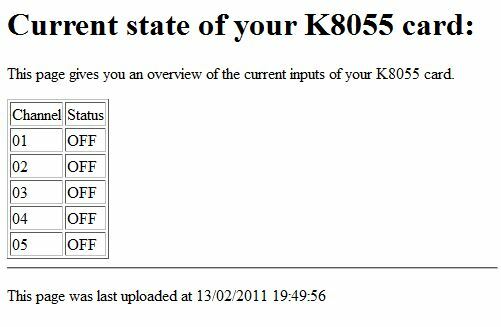 The Web Uploader is an application that will generate HTML pages with the state of your K8055 card. These pages are uploaded every few minutes (the used interval can be selected). You can see screenshot of the GUI in the image at the left. At the top of the program the state of all 5 digital inputs is indicated. They are represented by checkboxes: if the corresponding channel is active the input becomes checked. A second part of the GUI is the 'Uploader Setup' section. 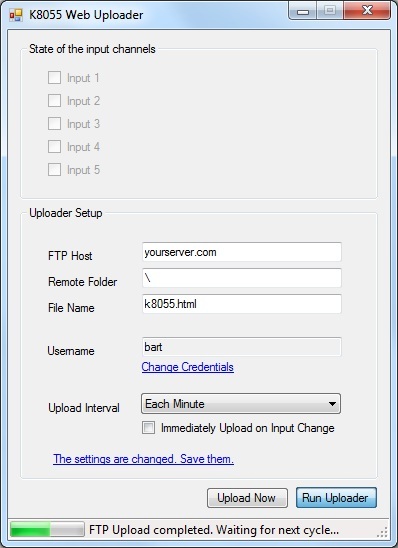 Here you can set all program parameters: FTP host, remote folder, filename, FTP account, FTP password and the upload interval. As soon as you enable the webuploader - this can be done by clicking 'Run Uploader' the webpages will be uploaded at a predefined interval. Although this is the recommended way the program also allows to perform an upload when an input changes. Check the 'Immediately Upload On Input Change' checkbox if you want to do this. Be very careful with this option as it might result in a server abuse: the server then might block your IP address. You can also initiate a single upload by clicking the 'Upload Now' button. This will immediately upload a page without waiting for the next upload cycle. The status bar indicates the current action: A short text describes what is happening right now. The bar also has a progress bar. It is used to give a visual indication of the remaining time until the next upload cycle. The image below shows you what the uploaded HTML file looks like. It is a plain HTML file without any formatting. By default it shows the state of all 5 digital input channels. At the bottom it indicates the time of the last update. This is an absolute requirement as it is the only way to detect if the information is outdated. The used HTML code is hard coded. You can find it in the Webpage class. The password for FTP is saved to the registry. It is encrypted but the key to decrypt can be found in the source code. You might want to set your own encryption key!